Barça battle Sevilla to a 2-1 victory. FC Barcelona continued their unbeaten start to the season with a hard fought 2-1 over Sevilla at the Camp Nou under the rain today. Lionel Messi was making his 600th appearance for the club but it was Paco Alcácer that was the star of the night with his brace. Barça took the lead, through Alcácer, in the 22nd minute for the only goal of the first half. Sevilla managed to level the score at the hour mark in the second half courtesy of Pizarro. 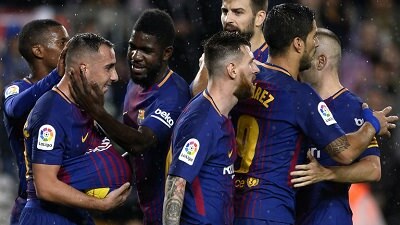 Alcácer scored the game winner in the 65th minute in front of the Blaugrana faithful for their 10th victory of the season in 11 games. They remain league leaders with 31 points, 4 ahead of Valencia as the international break arrives. Barça will be back in action on November 18, when they travel to Madrid to face promoted Leganés. FC Barcelona: Ter Stegen; Semedo, Piqué, Umtiti, Alba; Busquets, Rakitic (Mascherano, 89′), Iniesta (c) (Paulinho, 59′); Alcácer (Deulofeu, 66′), Messi & Luis Suárez. Sevilla CF: Soria; Corchia, Kjaer (Geis, 73′), Lenglet, Escudero (c); N’Zonzi, Pizarrro; Sarabia (Nolito, 61′), Banega, Navas; & Muriel (Ben Yeder, 76′). Previous PostBarça and Olympiakos play to a goalless draw. Next PostBarça remain unbeaten after defeating Leganés 3-0.